A good gourmet Thai Food restaurant in a modern and contemporary setting always leaves you a lasting impression. The newly opened NIMITR at 137 Pillars Bangkok is a real find and well nestled in the quiet Sukhumvit residential precinct and a two nights only crafted menu created by its award winning Indonesian born specialty Sous Chef Nanang, bringing Indonesian’s best from various region, is an additional bonus dining experience in Bangkok. mylifestylenews writes. NIMITR - the exquisite Thai restaurant created by the hotel’s Group Executive Chef and Culinary Artist, Peter Marx from Sweden described in his own words as “ Thai Inspired Modern Gastronomy” features mostly Asian inspired cuisine and constantly organizing guest chefs to present various inspiring gastronomy from around the globe. NIMITR in Thai means “A Special Dream” which is a space where you can experience exquisite avant-garde Thai inspired contemporary cuisine in a refined ambience. Blue hued mosaic walls and high ceiling creates a more elegant and jazzy mood in this intimate restaurant. With black marble table top marvels the sophistication of the décor and setting, the glass wall cellar and the entrance’s solid old wooden doors from Bali adds elegance and charm for this tasteful ambience. The hanging ceiling lamps (with a hint of Moorish design motif) starkly juxtaposed the blue pattern prints fabric on the brass ironed chairs and adds an ingenious touch and brightness to the entire restaurant. A true Indonesian meal in NIMITR for a two-nights-only culinary performance by Chef Nanang was presented. 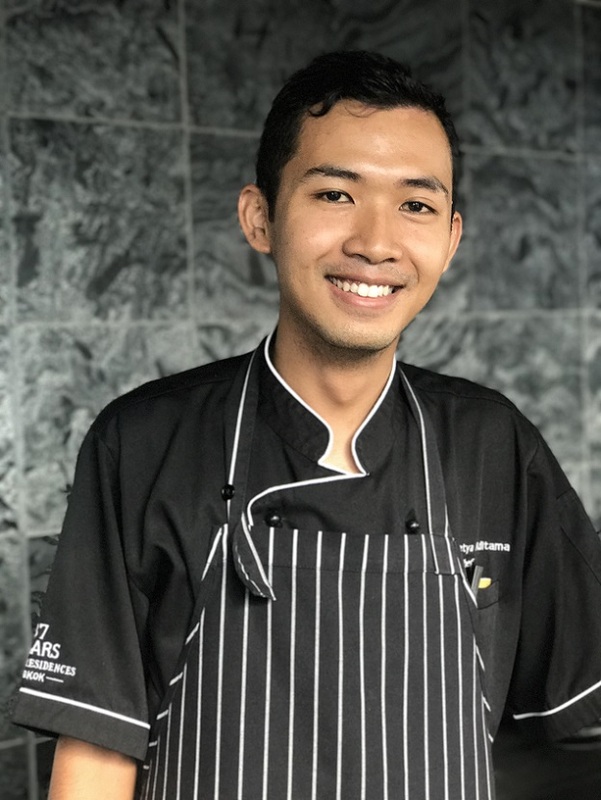 Chef Nanang redesigned a popular compilation of traditional Indonesian culinary delights from various regions across the country who also recently participated in Thailand Ultimate Chef Challenge 2017, which is endorsed by The World Association of Chefs Society (WACS) to promote and recognize the skills and professionalism of both young and talented chefs in Thailand and was awarded with a silver Medal in the professional Seafood Culinary Challenge and a Bronze Medal in the “Golden Bull” Australians Beef Culinary competition – Duo of Beef Flavor Challenge. The solid old wooden door from Bali welcomes you to a haven of "A Special Dream"
All dishes are prepared with a distinct and unique flavors, which results in this amazing six course cutting-edge Indonesian gastronomy set dinner menu. The Amuse Bouche begins with Lawar Bali – A Balinese chicken salad with long bean, coconut powder and lime chili dressing which is an ideal small bite to begin the Indonesia culinary quest. Mixed steamed vegetables with rice crackers, tofu, thousand year egg and sambal kacang sphere. Originally a Sundanese dish, this widely sold Indonesia salad is no stranger to anyone who had experience eating Indonesian food but when it is in the good hands of Chef Nanang, the usual peanut sauce dressing was elevated to sphere texture that mixed with sambal with a hint of chili pepper to round up the palate. Satay with three flavors of meat and three sauces, paired with Lontong. A clever mixed of three mouths full right bite size meat consists of chicken, beef and lamb accompanied with Lontong – a compressed rice cake as a staple food replacement of rice or potato in western culinary taste. Indonesia fragrant chicken soup with peanut paste, bean sprout and crispy potatoes. Here comes our favorite dish. A truly Indonesian classic! Turmeric and other herbs are added to get the yellow chicken broth and usually it is served in a clear broth. Nothing is too straight forward where Chef Nanang made it thicker to get a different texture and garnished with a crispy potato which is normally used to fill you up together with vermicelli noodles when you order this dish alone in any normal Indonesian eating establishments. Javanese steamed prawns marinated in yellow paste, flavored with Kemangi basil and tomato foam. The aromatic Kemangi basil complimented the steamed prawns with a light hint of spice and topped with deep fried shallot to give an additional kick in your mouth. East Indonesian (Lombok) cart grilled chicken with Plecing Kangkung, bergedel and sambal. The well marinated chicken was grilled to perfection with a lightly burnt barbeque motif and texture. By dipping with the homemade sambal with the bergedel (an Indonesian version of croquette) , it gives you a different lingering palate. Steam rolled banana on pandan rice mousse, served with coconut ice cream and grenadine. Another well presented dish to end the evening's Indonesia gastronomic journey with the refreshing coconut ice cream and steam rolled banana flavored with fresh pandan rice mousse, which is certainly a mouth cleansing desert to all. If you have someone to impress with a quiet evening night out that is worry-free with what you will get in return in consummate surroundings, NIMITR specialty culinary offerings will leaves you a lasting impression and becoming a food destination of note.